Toulouse lock Trevor Brennan is facing a lengthy ban after he allegedly assaulted an Ulster supporter in Sunday's Heineken Cup game in France. Brennan was warming up as a replacement when he left the playing enclosure before appearing to land a number of punches on the Ulster fan in the stand. The ERC announced on Monday that it would investigate the incident. Ulster will not cite Brennan for another incident, which led to him and Justin Harrison being yellow carded. Monday's ERC statement said both clubs had been asked to supply full details of the incident and that reports had been requested from match officials and broadcasters. Toulouse Rugby also issued a statement on Monday, defending Brennan and claiming that he acted in response to "repeated provocation" by Ulster supporters. The French club claimed that fans had made repeated references to the forward's mother and added that "such supporters have no place in any sporting arena and even less so in rugby". Brennan said in a column in Tuesday's Irish Times: "I approached this group, who threw beer at me. Some supporters told me not to pay attention to what they were saying. "I regret this incident happened. I didn't initiate or provoke it, it was the last thing I would have wished for." The statement described the former Ireland international as "a generous player who always respects his opponents and their supporters". They described Brennan's actions as "inexcusable but humanly understandable" and said they would ask the ERC to launch an investigation into the behaviour of some of the Ulster supporters. A Toulouse Police spokesman described the incident "as a private matter between two people" adding that they did not know "what all the fuss is about". The police spokesman refused to comment on whether the Ulster supporter Patrick Bamford had made an official complaint. An earlier Ulster statement said that former Ireland international Brennan had "left the playing enclosure and physically assaulted a member of the Ulster travelling support". "Ulster Rugby strongly refutes accusations regarding the use of sectarian language directed at Trevor Brennan by Ulster supporters and is hugely disappointed that this is being used in some quarters to excuse Brennan's assault on Patrick Bamford. "Ulster Rugby is entirely confident that the dialogue directed at Brennan was never of a sectarian nature and will be furnishing witness statements to that effect." Brennan runs a popular bar in Toulouse and eyewitness, BBC Northern Ireland journalist Julian Fowler said that a number of fans had made disparaging comments about the Irishman's premises. "A number of the Ulster supporters started to chant, 'Your pub's a load of rubbish'. 'Rubbish' wasn't exactly the word they used but it wasn't that much more offensive that that," said the BBC journalist, who also spoke to the supporter after the game. "He (Brennan) turned towards the crowd and climbed over a barrier and walked up the steps towards the eighth row where this fan was sitting. 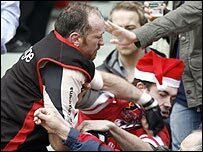 "There was a sustained, repeated attack and I saw at least half a dozen if not more punches using both fists, being rained down on this Ulster supporter. "The supporter was just a young fellow with a group of friends and I wouldn't have said that he was in any way drunk or aggressive." The BBC reporter added that the incident had left Mr Bamford's face bloodied and swollen. "I also spoke to him at the airport six hours after the incident and he said that he was still in a state of shock. "He didn't know why he had been singled out. He watched Brennan come towards him and he actually thought he was going to shake his hand. "The fan told me that he had made a statement to (French) police after the game but he wasn't sure last night what if any action he was going to take because he was still in a state of shock." Thirty-three-year-old Brennan is in the final year of his contract at Toulouse and a lengthy ban could end his career. After coming on a replacement, both the Toulouse player and Justin Harrison were sin-binned and Ulster coach Mark McCall afterwards insisted that Brennan should have been given a straight red card. Ulster lost the match 28-13, although both sides were already out of contention for a quarter-final place.